What Future For The Album In The On-Demand Age? When Napster emerged 15 years ago it kick started an irreversible transformation in music consumption. The music business had spent the previous three decades turning the singles dominated market of the 1950’s into the albums led market of the 1990’s, but with Napster consumers suddenly did not have to take the whole album package anymore. The labels had their own fair share of blame. When the vinyl LP had been the dominant format albums typically had 8 tracks, but with the CD labels felt compelled to fill every one of its 74 minutes’ capacity, resulting in a preponderance of filler tracks over killer tracks. Couple this with album price hyperinflation and you had the perfect recipe for consumer revolt. Little wonder that music fans cherry picked tracks, skipping the filler for the killer. Grazing replaced immersion. Ironically the issue became even more pronounced with the advent of the iTunes Music Store. Whereas with file sharing many users downloaded entire albums – and as bandwidth and storage improved, entire discographies – listening still skewed towards the stand out tracks. Indeed the hoarding mentality of these digital immigrants was one borne out of being children of the age of scarcity, with a ‘fill up quick while you still can’ mentality. With iTunes, price was a limiting factor and so people focused on acquiring single tracks rather than albums. Labels and artists had been scared iTunes would cannibalise album sales, they were right. In the subsequent decade new digital behavior patterns have become more clearly defined, particularly among the digital natives. 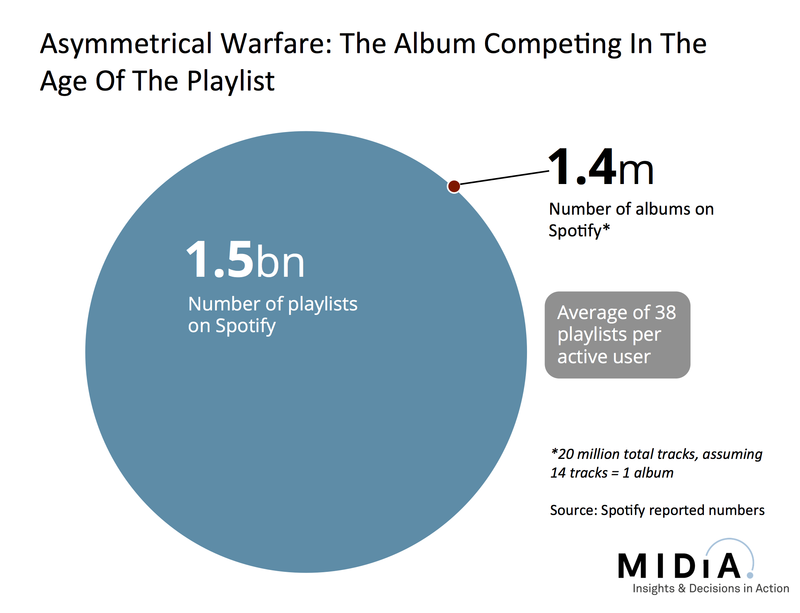 Playlists and individual tracks have become the dominant consumption paradigm. Even music piracy has moved away from the album to smaller numbers of tracks, with free music downloader mobile apps and YouTube rippers now more widespread than P2P. This is the piracy behavior of the digital natives who have no need to hoard vast music collections because they know they can always find the music they want on YouTube or Soundcloud if they want it. Even the much heralded success of Ed Sheeran’s album ‘X’ does not exactly paint a robust argument for the album. ‘X’ set the record for first week global plays of an album on Spotify with 23.8 million streams. But that represents just 0.27% of weekly Spotify listening (based on Spotify’s reported 40 million active users, 110 minutes daily listening and an average song length of 3.5 minutes). This is the consumer behavior backdrop for the demise of the album. Creatively the album still represents the zenith of an artist’s creativity and many albums are still most often best appreciated as a creative whole. Core fans and music aficionados will still listen to albums but the majority of consumers will not. The album as the mainstream consumption paradigm was a historical anomaly of the 70’s, 80’s and 90’s. In the 50’s and the 60’s the single was the way the majority interacted with music, and now in the early 21st century it is once again. There has always been space for vast diversity of artists along the niche to mainstream spectrum but as a consumption format the album is closer to the Steve Reich end than it is the Katy Perry end. The majority of artists will still make albums and labels will indulge them because their organizations and business models are built around the format. But therein lies the problem: the more that consumer behavior evolves, the more distant the gap between artists’ recorded output and their fans’ demand becomes. There is more music released now than ever before and most likely more music listened to than ever before. But the amount of music listeners in the world’s top 10 music markets – which account for 91% of revenue – has not increased at anything like the same rate. People are spending less time with individual artists and albums. In the on-demand age with effectively limitless supply they flit from here to there, consuming more individual artists in a single playlist than an average music fan would have bought albums by in an entire year in the CD era. Fewer fans develop deep relationships with individual artists. Right now this translates into fewer album sales. In 10 years’ time it will manifest as a collapse in arena and stadium sized heritage live acts. In fact we are already witnessing the impact, after all what are festivals and DJ sets if not the playlist translated into a live experience? As painful as it may be for many to accept, the tide has already turned against the album. The challenge to which artists and labels must now rise is to reinvent creativity in ways that meet the realities of the on-demand world. * If they do not, artists will eventually find the chasm between their wants and their audiences’ needs quite simply too wide to traverse. This entry was posted in Artists, Music, Music Formats, Music Products, Streaming and tagged Albums, BBC, Consumer Behaviour, Digital Immigrants, Digital Natives, Downloads, iTunes, Music Piracy, Napster, P2P, Playlists, Radio 1, Singles, Spotify, Subscriptions, Vinyl by Mark Mulligan. Bookmark the permalink. Brilliant piece and well timed. I believe that artists can form deeper connections with fans by involving them in the narrative. It’s not that the music business needs to move on from being album centric it needs to react to a changing society where people are less in awe of those on pedestals. Artists who thrive are those who carve out a place in their fan’s lives. It’s about involving the fans and realising that successful artists are conduits not preachers. Live music has much to learn from the DJ but it’s not all one way traffic. DJs are far more interchangeable than live artists. When a live artist makes a deep connection (and it still happens a lot) there’s very little that can break that connection. There are massive changes afoot in the live music industry and it’s great to see someone address that. Excellent piece Mark. We see this every day in the data we get from partners, and hear it every day from the music fans we speak to. The structure and skills in the building reflect the changing way people consume music. I think this will become more pronounced as streaming services reach the sort of scale the web allows. What’s the split between Spotify playlists that are actually for “listening to” and those that are actually just a means of getting a full album onto a portable player/saving for offline use? That’s the behaviour is see from my friends (albeit we’re mainly of the “album generation”). Small remark to make here, regarding the number of saved playlists in Spotify: if I’m not mistaken, a lot of people use or used a playlist to save an album for easy access, because in the past this was the only way to do so. I have 80-something playlists, of which 4 are not albums. But I totally agree with the general message here. Still more has to be one against piracy. Still more has to be done against piracy. I would argue that the rise and fall of the album has more to do with quality of the music on an LP/CD then changes in technology. In the 50’s and early 60’s albums were made up of a couple of hit singles, which most fans already owned in the form of 45’s, and six weak, hastily written songs for filler. The Beatles and Bob Dylan put an end to this practice. Nearly every song on every one of their albums were fresh and compelling. They raised the bar for the album. And may artists rose to the challenge, The Doors, The Velvet Underground, Jefferson Airplane,etc. put out great LP’s Albums in their entirety were being played on FM radio and in dorm rooms across the country students listened to and discussed entire albums. But even during the hey day of the album, few artists could keep up with creative output of Dylan or the Beatles. Generally by the third or fourth album even the quality of the best bands material began to slip. So, when iTunes gave people the ability to cherry pick tracks from early rock ‘n’ roll LP’s or the catalogs of more recent artists, they did so. If we want to revive the album format artists, consumers and music companies have to accept the fact that good songs are not made on an assembly line. A songwriter never knows when he/her will write his/her next great song. The typical record deal needs to be revised to reflect this fact. When an artist signs a contract he/she agrees to deliver x albums over a period of y years. Usually a band will have written enough material in the 10-20 years leading up to their first album to produce a high quality album, but now they have a year or less year to write material of equal quality for their second album. If they can’t, they are forced to put sub par material on the album. Deals could be structures that specified the number of albums and artist agreed to deliver to a given record company, but gave the artist the freedom to deliver the albums when he/she felt they were ready. Sure there might be less music out there, but what was out there would be would be worth buying. You’re wonderful so it’s this blog. I’m from Brasil and I’m always in here ’cause I’m fascinated how music industry works and I have a lot of doubts about future in music industry. I really don’t know how record labels will do to make the business on the tracks I can’t think in a “solution” I love Spotify and I love iTunes but when it comes about to spend money I rather buy the whole album on CD format. I think it’s a well spend money on music but I confess that I don’t buy everything just my favourites. And I don’t have any CD equipments anymore. website link on youг page at proper place and other person will аlso do same in support of yⲟu.